The Engineers of Tomorrow High School Robotics team would like to give your students a head start on FIRST Lego League robotics. These camps will give students the opportunity to learn robotics using the LEGO Mindstorm kits. They can expect to learn computer programming, mechanical engineering, presentation practice, and develop team building skills. Using challenges from previous year First Lego League (FLL) seasons and our own creative learning experiences, students will have a fun and creative camp. This camp is geared to give students a great head start before the start of the 2017-20188 Robotics season. 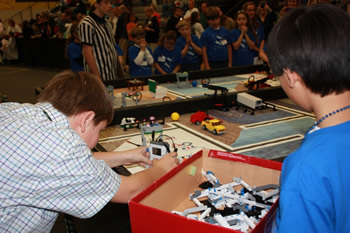 The Engineers of Tomorrow High School Robotics Team invite rising 4th– 6th graders to get a head start on the 2017-2018 FIRST Lego League (FLL) Season. The Engineers of Tomorrow High School Robotics Team invite rising 4th– 8th graders to get a head start on the 2017-2018 FIRST Lego League (FLL) Season.